Tens of thousands of people across Europe and North America has decided to bring in the New Year with a polar bear plunge, braving frigid water both for fun and charity. The Dutch have been taking the New Year swim since 1960, though what once started out as a niche activity has clearly ballooned into a widespread phenomenon. "It's a true tradition that gives a fresh start to the year and immediately puts your resolutions into practice," a 30-year-old man named Martijn told AFP. 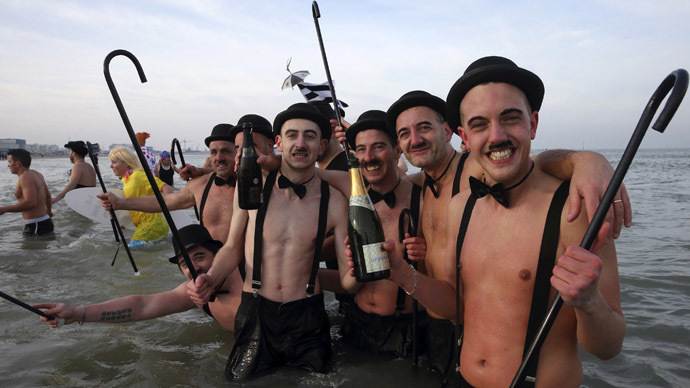 Around 400 people also turned up to brave a dip in the North Sea in the northern French city of Dunkerque. "It's nice once it's finished," one of the divers told AFP. Similar, though small smaller dips into the cold were taken in Germany, Switzerland and Ireland. On the other side of the not entirely frozen pond, people were equally willing to brave the inevitable chill that would settle in their bones upon hitting the water. In Canada, participants had their pick of glacial waters from the Atlantic to the Pacific and everything in between. In Toronto, more than 700 people threw caution (and their clothes) to the wind as they jumped into Lake Ontario. Madu Burja, a 28-year-old Peruvian, told the Toronto Star about the shock and exhilaration immediately after experiencing what she called the most extreme cold of her life. “It’s the part where you cannot feel your body . . . at that moment I couldn’t breathe. I’m really excited about this,” she said. In the suburban fishing community of Herring Cove in Nova Scotia, 125 people stripped down to Speedos, spandex and tutus before diving off Government Wharf. Terry Spearns, who made her 13th jump on New Year’s Day, told the Chronicle Herald she thought this year might be her last. For those wondering how she’s made a baker’s dozen of plunges, she has a bit of advice. Farther south, similar events were held throughout the United States. “Only fools jump in — because we’re fools and we’re going to jump in ice cold water today,” two participants, dressed as Elvis, told CBS Denver before plunging into the Boulder Reservoir. While some merely did it for the thrill, many were attempting to raise money for charity. The Herring Cove Polar Bear, for example, raised $4,200 for Feed Nova Scotia, while the Boulder County AIDS Project raised nearly $25,000 with their 32nd annual plunge. Perhaps doing good for others will help warm more than a few hearts, even if it takes a while before they can feel their feet!